Description: The Book of Job in Form presents to the reader a platform for a personal and intensive encounter with a great work of art. Its bilingual centre offers the text in Hebrew and English, and shows the forty poems in their original form, in 412 strophes and 165 stanzas. The commentary points out how these proportions and the remarkable precision of the poet (who counted syllables on all text levels) affect the thematics of the book, so that the portrait of the hero can be redrawn; his stubbornly defended integrity meets vindication and his last words, generally misunderstood, require a positive understanding. The poetry and its slim framework in prose are a unified composition which deserves a synchronic approach. 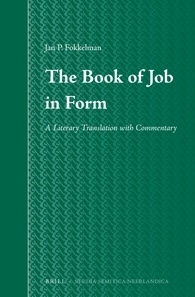 Citation: Roger Marcel Wanke, review of Jan P. Fokkelman, The Book of Job in Form: A Literary Translation with Commentary, Review of Biblical Literature [http://www.bookreviews.org] (2014).